This time it is the turn of DC Central Kitchen’s Mike Curtin (who you may remember from last time’s Chain Reaction interview!) to speak to Melat Yosef, Founder of VitaBite, an Ethiopian social enterprise which aims to educate mothers in nutrition for their children. Over a questionable Skype connection from Washington DC to Addis Ababa, the pair discussed the birth of VitaBite, as well as their excitement for the Forum in September. Mike Curtin: Hi Melat, how are you doing? It’s great to meet you this way in advance of the World Forum in Scotland, which is going to be great fun. I was fortunate enough to come to DC Kitchen 14 years ago, so I’m always impressed when I see folks starting something off right from the beginning like you. I always find that really inspiring. Can you tell us a bit about VitaBite and why you started it? From what I can read it seems like a really personal story, which is always very important for me when thinking about why people do what they do. Melat Yosef: The reason my partner and I started VitaBite is that we are both mothers and by the time our children were six months old and needed to start on solid food we had no idea where to start. Malnutrition is a big issue in Ethiopia. We considered ourselves some of the most privileged here because we’re educated and we can afford what we need, however even we felt that providing sufficient for our children was challenging. We thought that if we were facing this challenge, other mothers would be too. We wanted to increase awareness and education. So we decided to work on malnutrition communication in September 2015 and we started by producing a cookbook for urban communities in Ethiopia. We developed 53 recipes from easily available ingredients and affordable but nutritious meals. We included the importance of a balanced diet during pregnancy and how the mother can balance her diet during pregnancy, as well as the benefits of breastfeeding for the mother and child. 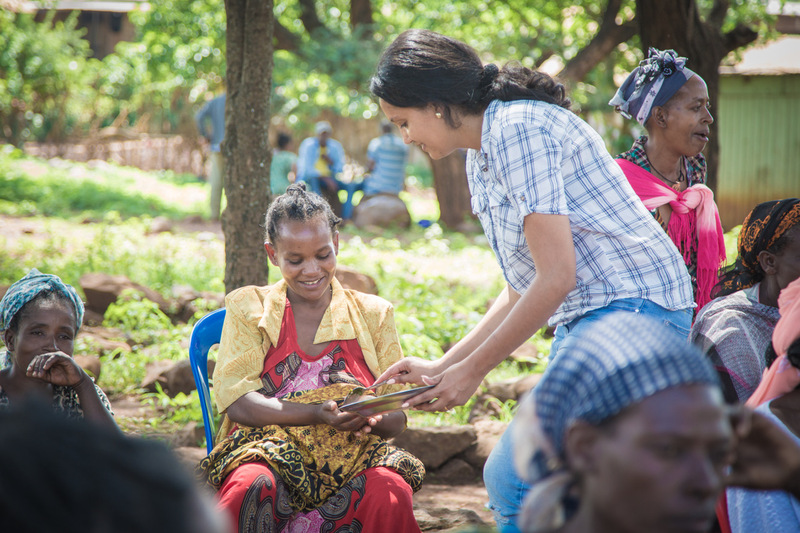 And after that we began working on other nutrition projects with messages to help mothers all over Ethiopia. MC: So all of this happened in about two years, that’s amazing. MY: Yes, it was established in September 2015, but our most productive year was 2016. MC: Of those few years what would you consider your best accomplishment? MY: Addressing malnutrition in Ethiopia. It had been neglected by the government and international organisations in Ethiopia because the problem is higher in rural areas than urban areas. The other big achievement that we have had is being able to push a balanced diet with easily available ingredients, although that’s something we’re still working on. In areas affected by poverty it can be hard, but we tried to come up with innovative solutions about chicken rearing, home gardening, and so on for the rural communities. We still have a lot of work to do in that regard. MC: Did you see yourself on this trajectory ten years ago? MY: Ten years ago I had no idea that I would be working in the field I am now, but experiencing those problems personally gave me the passion to end up here. Now we’re doing everything we can to try and tackle malnutrition amongst mothers and children. I hope the government will understand that poverty and malnutrition are related and we need an innovative solution to tackle poverty. MC: Are you looking forward to the Social Enterprise World Forum in September? MY: I know that in the UK, and especially in Scotland, that social enterprise is very well-established, so I’m looking to learn more about being sustainable and inclusive from others. VitaBite is one of the founding social enterprises in Ethiopia, so we’d love to learn from Scotland and others on how to inspire others to grow here, too. I’m also looking forward to learning about measuring impact, which should help us in our aim to influence government policy. MC: I’m looking forward to it, too. I think it’s a powerful thing that we are people all over the world that are all basically doing the same thing. America is a scary place to be right now and it gives me tremendous hope when I talk to people like you and the others that will be there. I think it’s going to be an amazing experience. Interview facilitated by Caroline Hailstone. Look out for the next link in this interview chain when Melat Yosef will be putting someone else in the hot seat – coming soon.